The figure above shows the automation for the electronics that should be in precise sync. with the written score. It means that when the Bass Drum starts playing its rhythm pattern there is an increasing reverb coming in and very strong feedback. At the same time, the piano plays a chord that at the beginning should have very little electronics with increasing delay and feedback as the chord dissolves in single notes. After the fermata pause in measure 14, the flute starts with a solo in measure 15 that should have increased granulation and reverb. Before going further let us listen to an example made during a “read through” meeting with flutist Trine Knutsen, conductor Halldis Rønning, and composer Hilmar Thordarson. First we will hear the flute only, then with electronics added with computer simulation, and finally recordings from the Harpa concert. 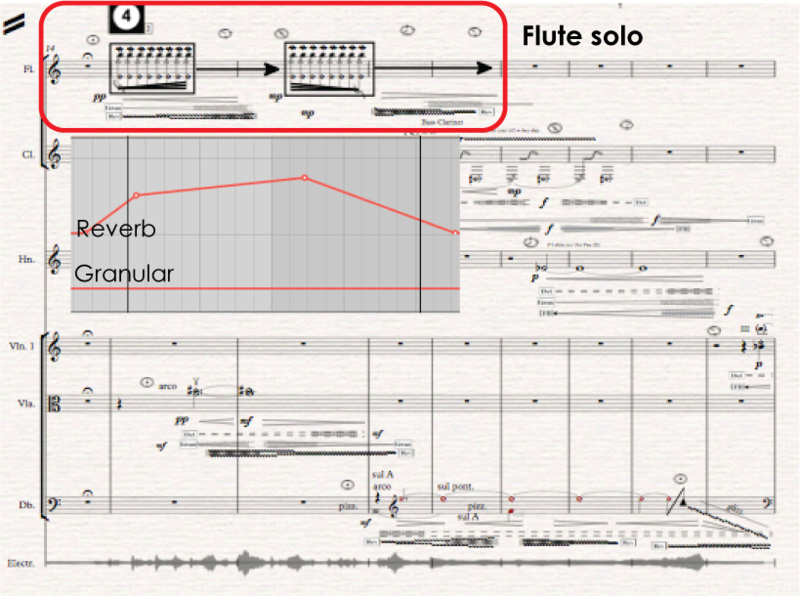 In the computer simulation, the original recording of the Flute from the first example is used with added electronics exactly as they appear in the Ableton Live. I was expecting since the Flute solo begins with a 100% sync with written electronics, that the difference would be less between the simulation and actual concert release. It is obvious that the microphone is not picking up the sound of the Flute properly because the reception of electronics is so soft. There may be a need to make improvements to the position of the microphone DPA 4099HI instrument microphone (clip-on microphones). It should also be kept in mind that computer simulators always give a stronger sound image than the actual version, and therefore one should expect the strength to be reduced. Listening and comparing recordings from the three concerts there is a very little difference, and it is to the best of my recollection that the conductor had raised the volume of the electronics to an acceptable field of strength. However, it would be worth to take some time and do experiments both with microphone position and the conductor’s volume level to find out if it is possible to have a little more effect on the sound. In measure 25 the Clarinet comes in with three repeated multiphonics (chords) that has a decreasing Delay and Granulation. 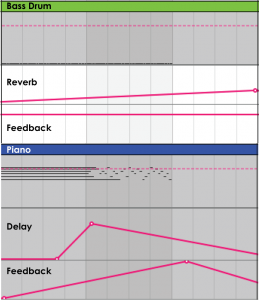 At the same time, there is an increasing Reverb and Feedback effect. In measure 29 the Piano enters with a chord that goes into the fast-moving fragmentation of the same chord with increasing Delay and Feedback. In the Harpa example, the electronics are quite audible and close to what should be expected, in the Torshavn example, they have much less volume and the Copenhagen performance seems to be somewhere in between with the electronic level softer than in Harpa and louder than in Torshavn. There is a significant difference of the Clarinet electronics between these performances while there is less difference between the Piano electronics. 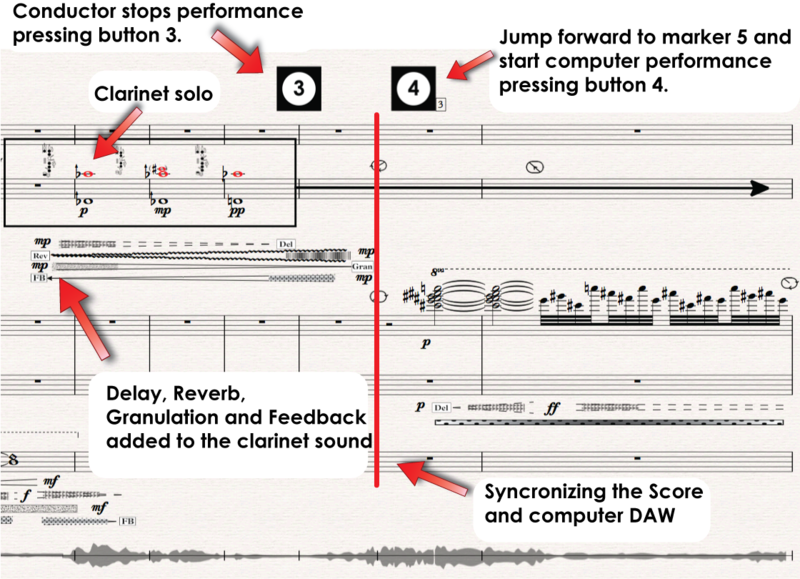 This can most likely be explained by the simple fact that the Piano entrance is right after the score and the DAW have been synchronized and therefore right on the spot while the clarinet entrance might be a little bit out of synchronization since it was last synchronized in measure 15. The hall in Harpa had a bit more wet acoustic than the Torshavn hall with the Copenhagen hall the driest sounding. New post later concerning these issues. Let us now look back and listen to a video recording of the Copenhagen performance measure 18 – 32. As illustrated in the video the conductor raises the volume level during the long crescendo note in the Horn (measures 19-22) and then keeps that level until the Violin enters in measure 22. After that, she decides to lover the level a bit, perhaps a bit afraid of getting a too strong signal and therefore increasing the risk of a feedback. Soon after the conductor feels secure enough to raise the electronic volume value up again. This is a very good sample of how the conductor can in real time adjust the balance between the sound level of the instruments and the electronics. It is very interesting to take a look at the same measures during the other performances. It is obvious that the conductor has practiced this part and is quite constant in increasing the electronic volume during these measures although with variations. Unfortunately, the video camera does not catch the whole stage and is located on the wrong side of the conductor. It still gives an idea of the conducting progress where the conductor increases the electronic volume value a bit earlier than in the Copenhagen video. Then she does not adjust the volume the second time as before meaning that the overall electronic volume value is less. Although I personally would have liked a bit more electronic volume it clearly shows that the conductor is in charge and makes her own personal adjustments exactly as she does when adjusting the volume level of the acoustic instrument. It proofs the success “the aim,” of the ConDiS project to create a conducting tool that allows the conductor to adjust the electronic volume value in real time as well as adjusting the acoustic sound. As said before the Harpa concert had the strongest electronic volume value of all the concerts. Probably due to the conductor not able to hear the electronics as clear as in the other performances. Still, she does very similar conduct during these measures as in the other performances. The electronic value is increased earlier than before but she does make a second adjustment by increasing the value a bit more one measure later. After that, she is satisfied with the balance and does not further adjustments in the coming measures.